One refreshing change from high school is that, as an engineer, I'm expected to pursue practical work experience. "Practical work experience," for a Michigan Engineering student, usually consists of internships, "Design-Build-Test" (DBT) courses, and personal projects. Of those, a freshman can usually only pursue DBT courses, like MECHENG 250 and some sections of ENGR 100 because most companies won't hire freshmen. Freshmen who hope to do more – like my younger self – have to look for opportunities elsewhere, the most obvious of which are the Wilson Center’s student design teams. What is the Wilson Center? Literally speaking, the Wilson Student Team Project Center (usually called "the Wilson Center," or sometimes just "Wilson") is a workshop space, sequestered in the most remote location possible while still technically being on the main university campus. But don’t worry; you can take a bus! The Wilson Center provides a machine shop, a paint booth, office spaces, and general "assembly areas" stocked with useful tools. It's equipped with a drill press, a lathe, a CNC mill, rotary grinders, bandsaws, rotary saws, CNC mills, a metal shear, a wide variety of hand tools, oxyacetylene cutting torches, welding equipment, various sinks, a fridge, and a toaster oven for some reason. The Wilson Center primarily acts as the seat of U-M Solar Car's imperial authority. It also secondarily serves as the home of the Wilson Center’s student project teams. In addition to providing these teams with a permanent home, the Wilson Center gives them the supplies and tools they need to work day-to-day. Teams like MRacing, MFly, Steel Bridge, and UM::Autonomy have permanent workspaces (and, if they're lucky, full offices) inside the building. 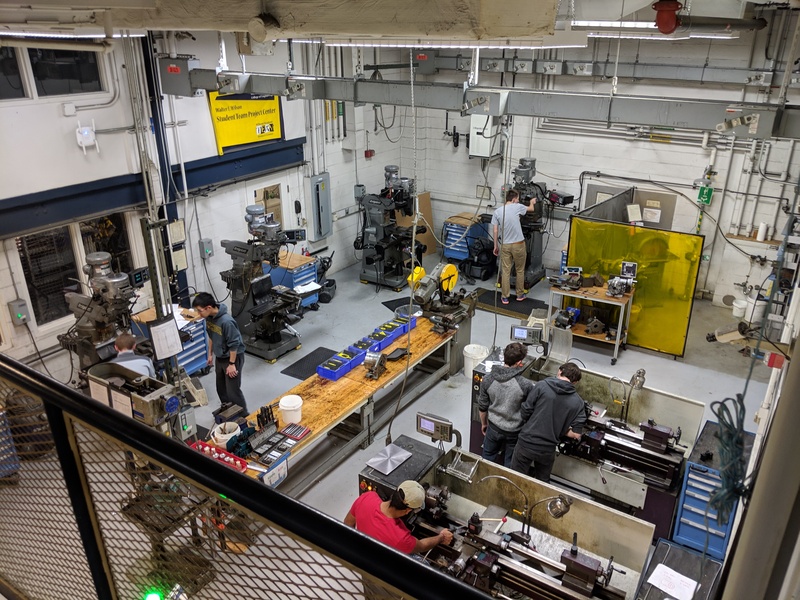 The Wilson Center also functions as a machine shop for the College of Engineering; students taking some courses (like the aforementioned MECHENG 250) use the Wilson Center's machinery to fabricate their class projects. How do you get access to the Wilson Center? Completing training involves (as of the time of writing) self-studying from a presentation on basic workshop safety, and completion of a hands-on project to prove that you can work in the shop without maiming yourself. Should you complete and turn in this project – building a pencil holder out of aluminum stock and sheet metal – and if grading it doesn't give the Wilson Center staff tetanus, you gain daytime access to the Wilson Center: your MCard (student ID) will let you swipe yourself through the Wilson Center's main entrance. Pictured: my aluminum pencil holder. Not pictured: tetanus. It's assumed that you're completing training to join a design team. Once you've proven yourself worthy in the eyes of your team leads, those leads can ask the Wilson Center staff to grant you 24-hour access. Why did you join a Wilson Center design team? I wanted to fill my resume – not with resume chaff, but with resume grain. At the time, I was still a bit of a glory chaser, and I entertained fantasies of working for organizations like SpaceX and NASA JPL. As one would expect, veteran membership on a Wilson Center team looks fantastic on a job application; several consecutive team captains of Michigan Baja Racing, I'm told, went on to work at SpaceX after graduation. I was young, ambitious, uncommitted to any other extracurricular activities, and I wanted to set myself on that same track. What did you get out of the experience? I gained a tremendous amount of technical experience from my time on Yilin's Old Design Team (YODT), and I would even say that being on YODT was the single most instructively rewarding thing I have done in my entire college career. By the end of my first year, I had already been given nearly full responsibility over entire software modules. I wrote tens of thousands of lines of C++ during my tenure; this was So Much Typing that I, at one point, actually developed tendinitis in both forearms. I built an entire repository: migrated old code, refactored old code; read about good object-oriented design; configured a build system; wrote test suites; wrangled with git; and became – if not a vim god, then at least a vim deacon. I became a (jazz hands) Self Starter™: I Took Initiative™ in tackling the technical and organizational problems with which YODT was faced. I adopted a growth mindset. I learned that one of the most crucial qualities that separates a Great programmer from a merely Adequate one is the willingness to learn new tools if those tools are the best tools for the task at hand. I got really good at solving obscure technical problems by furiously Googling things, which is 95% of being an effective computer programmer. I can say, unequivocally, that being on this design team made me the programmer that I am today. Even though my overall experience was positive, there were a few things that didn’t go as smoothly as I thought they would, and I think it’s worth mentioning them because in the end, they turned out to be Learning Experiences. What did you get out of the "less peachy" experiences? I'm going to ramble for a bit. The Wilson Center design teams are almost entirely student-run, with levels of faculty supervision ranging from "occasionally present" to "none whatsoever." Teams are therefore free to develop their own culture and practices through experimentation. "What quest?" said Hermione. Her voice was trembling, because it was very clear what answer the Headmaster was looking for and she didn't want to give it. "What happened to Harry back then, why was Fawkes on his shoulder?" "He grew up," said the old wizard. His eyes blinked several times, beneath the half-moon glasses, and his face suddenly looked very lined. "You see, Miss Granger, people do not grow up because of time, people grow up when they are placed in grown-up situations." Being trusted with Real Responsibility – positions of power and leadership and authority over one's peers; and difficult, novel problems that must be solved in a limited time frame – is, I think, an essential part of Growing Up. Because when your (or others) are first trusted with Real Responsibility, you (and they) are first going to Fail Real Hard; and learning to recover from that failure, and learning how not to fail in the same way, is how we grow. I stress that others will fail just as much as you do: learning to deal with others' failure is just as important as learning to deal with your own, and it is also every bit as miserable. Team meetings will drag on without any agenda; small disagreements will erupt into conflagrations of drama that ruin team productivity for weeks; "dry-run" tests will start, only for the team to realize that half of the necessary materials were left in the Wilson Center, half an hour's drive away; "dry-run" tests will resume, only for the team to realize that the other half of the necessary materials were also left in the Wilson Center, half an hour's drive away. (rhymes with "Dylan") is a junior in the College of Engineering. Though free-spirited and soulful in his youth, Yilin was doomed to major in computer science after being kidnapped by feral app developers and raised in the Michigan wilderness. Outside of his classes, Yilin organizes community service opportunities for the engineering honor society Eta Kappa Nu, writes plugins for obscure open-source text editors, and injures himself grievously while riding Bird scooters.